Photo from Flickr, created by user NS Newsflash. Available under a Creative Commons license. 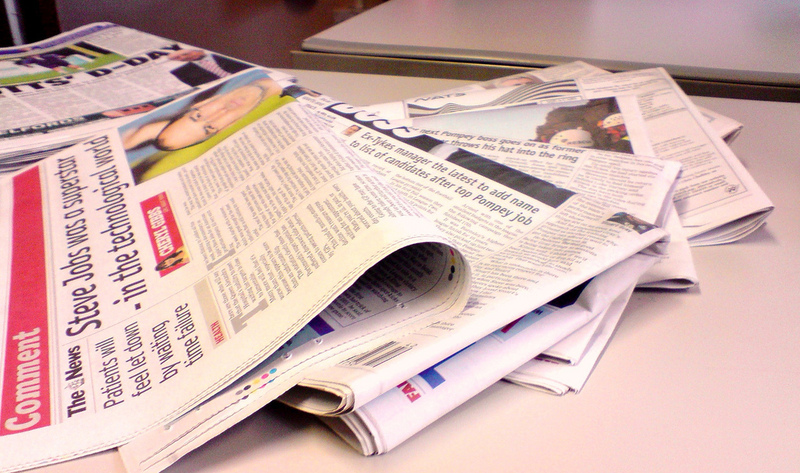 Articles may also come from journals or magazines. Author's Last Name, First Name. "Title of Article: Subtitle if Any." Name of Newspaper [city of newspaper if city name not in name], Date of Publication, p. Page number if given. Name of Database, Permalink, Stable URL, or URL. Accessed date. Rosenberg, Steven A. “Paperless Education.” Boston Globe, 5 June 2016, p. B1. SIRS Issue Researcher, www.northeaststate.edu:3443/login?url= sks.sirs.com/webapp/article?artno=0000384236&type=ART. Accessed 27 Aug. 2016. Morrison, Malcolm. "TSX Recovers on Greece News." thestar.com, Toronto Star, 23 June 2011, https://www.thestar.com/business/economy/2011/06/23/tsx_recovers_on _greece_news.html. Accessed 7 June 2016.